At more than 3,000 pounds dry, the all-new Ford GT supercar isn’t exactly as lightweight as many had expected – and indeed, hoped. It is, after all, a $450k+ bundle of cutting-edge technology featuring a monocoque and body made of carbon fiber; who would have thought it’d weigh more than some everyday compact cars? But according to a recent article by Autoblog, a lighter-weight variant of the new Ford GT dubbed the “Competition Series” may be on the way. 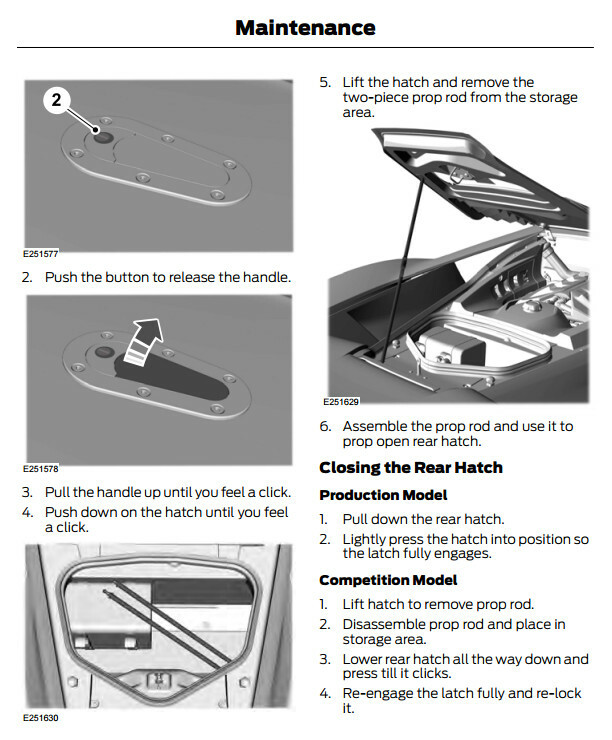 The proof is in the GT Owners’ Manual, which on two occasions refers to the Competition Series model: once on Page 42, in a section about key fobs and rear-hatch access, and once starting on page 48, detailing how to use the Competition Series model’s unique hood prop rod. Page 149 of the Ford GT Owners’ Manual. Click for larger. The notion that the Ford GT Competition Series could be a lighter, more pared-down version of the supercar doesn’t seem at all farfetched given that it apparently A) won’t have an electronic hatch release like the regular model, and B) utilizes a two-piece prop rod to hold the hood erect rather than a hydraulic strut. Of course, those two changes alone would mean very little for the car’s overall weight, leaving us to wonder where else the lighter-weight Ford GT might have shaved a few pounds. We can only speculate, but the idea of a non-adjustable suspension is intriguing to us. You’d better believe we’re looking forward to learning more. Follow this link to check out the Ford GT Owners’ Manual yourself.